Food entrepreneurship as an after-school activity? Over the last few years, Detroit Food Academy has been making exactly this a reality for young people in the Motor City. 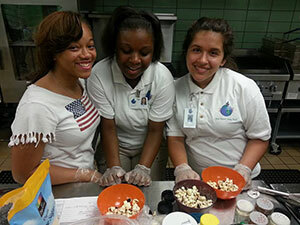 With help from local educators, schools and food businesses, the nonprofit project teaches food preparation and leadership skills to Detroit high school students through after-school programming. Youth participants learn what it’s like run their own business and get a chance to whip up recipes and debut them at a pop-up-style event. Graduates of DFA’s fall-through-spring school program also have the opportunity to apply for summer internships. Executive Director Jen Rusciano tells Seedstock the project uses food entrepreneurship as a lens to explore social issues like racism, gentrification and food access. This past last year, 100 youth from a mix of six Detroit public, charter and Educational Achievement Authority schools participated in the after-school program; twenty-five were placed in summer internships. Impressive numbers for a project that started less than five years ago. Back in 2011, a summer-only prototype was launched then known as the Detroit Youth Food Brigade. That name was eventually dropped, because students found it too much of a tongue twister. Under the early incarnation, students from high schools and community organizations across the city helped create and sell value-added food products with vendors at Eastern Market, a Detroit farmers’ market and nonprofit that provided money for the project. It proved popular and other schools got on board. After two seasons, students from Cody High’s Detroit Institute of Technology asked the organizers if they could continue the programming at their high school when fall classes began. Together they got the principal on board and created the first DFA year-long program. With grant funding from groups like the Skillman Foundation and the United Way, the program transformed into its current setup. During the school year, the program now takes place at student’s schools and is divided into two parts. In the fall, students learn the basics of cooking and events planning–things like the right way to use knives, healthy nutrition and budgeting meals. They also take field trips to Detroit farms and businesses and participate in workshops with local chefs and others in the food industry. The youth spend the spring semester developing their own food product while adhering to a triple “people, planet, profit” bottom line to ensure their business model respects the needs of the earth, local community and marketplace. At the end of the school year, students showcase food creations at a special “Market Day” event, which might be a meal for family and friends at their high school or a pop-up at a local grocery. After completing the program, students are eligible for a chance at a summer internship that could involve launching their own businesses at Detroit grocery stores or farmers’ markets or developing culinary skills under the tutelage of a local mentor chef. For some, it’s their first summer job. This year DFA students made Mitten Bites, little cookies made of oats, peanut butter, coconut flakes, honey, chocolate chips and other ingredients, formed into the shape of the State of Michigan. Other products have included granola, zucchini chips and dehydrated fruit. Rusciano calls this hands-on teaching experiential learning and stresses that the youth themselves determine the course of their own education. As an example, she brings up a discussion DFA students had about food justice and the pricing of food. One retailer even remarked it was the first time he’d ever been asked why he chose a particular price for a strawberry. This relationship-building with community members is an important part of the program. In the past they’ve also had opportunities to connect with community gardeners, branding designers, farmers’ market vendors and a Wayne State economics professor. Rusciano says in all, 225 local youth have participated in DFA programming, and she believes it’s made quite a difference.